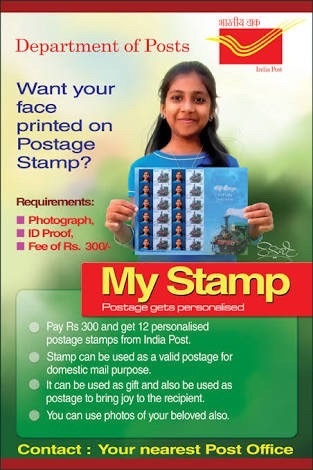 ￼You may be aware that you can print your own stamps through India Post. The personalization is by printing a thumb nail photograph of the customer images, images of artwork, heritage buildings, tourist places, wild life, animals,birds, etc. alongside the selected commemorative postage stamp. The cost of My Stamp sheet is Rs300. We need to fill up a My Stamp order form, indicating choice of stamps from available stamp sheetlets. This form will have to be submitted, duly signed along with the ID proof issued by the Government. The required cost is to be paid to the counter clerk (mostly at Head Post Offices) and an acknowledgement obtained. Customer can provide his/ her photograph clicked or provide hard/ soft copy. Photographs can also be the images of things described above. We need to ensure that they are free of copy right restrictions. The customer is required to collect his/ her stamp sheetlets within 7 working days during office hours, by producing the acknowledgement. India Post also offers discounts at 10% and 20% respectively, depending on the number of sheetlets ordered. Enjoy printing your stamps and give it your friends and relatives.